Indonesia appears to be the new environmental discovery hotspot. I'd been reading up a bit on the wildlife of Sumatra and Borneo lately anyway (the book The National Parks of Sarawak having piqued my interest). It's funny, but I remember looking at the clouded leopards in Melbourne Zoo and thinking they weren't quite as I remembered from pictures in books. All is explained! From theBBC news "Clouded leopards found on Sumatra and Borneo represent a new species, research by genetic scientists and the conservation group WWF indicates. Until now it had been thought they belonged to the species that is found on mainland southeast Asia." "Genetic research results clearly indicate that the clouded leopards of Borneo should be considered a separate species," said Dr Stephen O'Brien, head of the US National Cancer Institute's Laboratory of Genomic Diversity. "DNA tests highlighted around 40 differences between the two species." Apparently, the two species diverged at a similar time to lions and tigers - over a million years ago. Given the evident physical differences in coat markings, there must be quite a few naturalists and scientists having a "Doh!" moment over this one. However, telling the difference between a species and a subspecies isn't always so easy (ask anyone who has studied tree-kangaroos, or even ringtailed possums). "The three governments with territory on the island - Indonesia, Malaysia and Brunei - signed an agreement earlier this year pledging to protect the "Heart of Borneo", 200,000 square kilometres of rainforest in the middle of the island thought to be particularly high in biodiversity." That's a promising commitment on two islands highly troubled by land-clearing, mostly for the expansion of palm oil plantations, and logging for the pulp & paper industry, both legal and illegal. Sumatra and Borneo contain some of the world's richest biodiversity in their rainforests. When we used to live down in Aspendale, along the creek there was often beautiful singing in the evening, which was my first real awareness of reed warblers - a widespread but secretive wetlands bird. 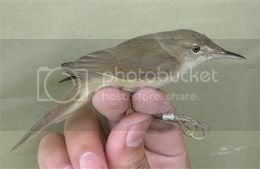 This one looks a bit like an exaggerated version of the usual reed warbler. From The Telegraph long thought extinct Large-billed reed-warbler isn't extinct after all: "A bird last seen alive in India almost 140 years ago and considered extinct has been rediscovered at a Thai sewage works by a British researcher. Philip Round, assistant biology professor at Mahidol University in Bangkok, made the discovery by chance when he was ringing birds in reed beds at a waste water treatment plant south-west of the Thai capital. "Although reed-warblers are generally drab and look very similar, one of the birds I caught that morning struck me as very odd. Something about it didn't quite add up," he said. "It had a long beak and short wings. Then it dawned on me. I was probably holding a large-billed reed-warbler. I was dumbstruck. It felt as if I was holding a living dodo." Back in Sumatra again, Biologists record call of rare Sumatran ground cuckoo for first time - "A team of biologists with the New York-based Wildlife Conservation Society (WCS) have recorded for the first time the call of the extremely rare Sumatran ground cuckoo, found only on the island of Sumatra in Indonesia. The bird was captured by a trapper and handed over to WCS biologists, who recorded the bird’s call while it nursed an injured foot. "Ornithologists believed the bird was extinct until 1997, when a single individual was briefly seen. Until now, however, no one knew the bird’s call - a key field diagnostic ornithologists use to identify birds that live in forest." The picture (of a different individual) was taken last year with a camera trap set up to search for other critically endangered species such as the rare Sumatran tiger and Sumatran rhinoceros. Sumatran ground cuckoo, Wildlife Conservation Society, AP Photo/Birdlife International, from the Discovery Channel site.